Buddhism – Ashoka initially practiced Hinduism but subsequently embraced Buddhism, following the Kalinga War, he renounced expansionism and aggression, and the harsher injunctions of the Arthashastra on the use of force, intensive policing, and ruthless measures for tax collection and against rebels. Ashoka sent a mission led by his son Mahinda and daughter Sanghamitta to Sri Lanka, whose king Tissa was so charmed with Buddhist ideas that he adopted them himself and made Buddhism the state religion. Ashoka sent many Buddhist missions to West Asia, Greece, and South East Asia, and commissioned the construction of monasteries, schools, and publication of Buddhist literature across the empire. He is believed to have built as many as 84,000 stupas across India i.e. Sanchi and Mahabodhi Temple, and he increased the popularity of Buddhism in Afghanistan, Thailand and North Asia including Siberia. Ashoka helped convene the Third Buddhist Council of India and South Asia’s Buddhist orders, near his capital, a council that undertook much work of reform and expansion of the Buddhist religion. Jainism – Emperor Chandragupta Maurya embraced Jainism after retiring. At an older age, Chandragupta renounced his throne and material possessions to join a wandering group of Jain monks. Chandragupta was a disciple of Acharya Bhadrabahu. 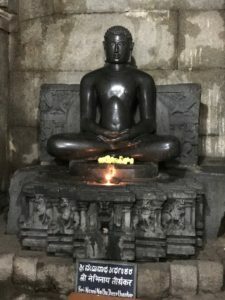 It is said that in his last days, he observed the rigorous but self-purifying Jain ritual of santhara that is fast unto death, at Shravana Belagola in Karnataka. However, his successor, Emperor Bindusara, was a follower of a Hindu ascetic movement, Ajivika and distanced himself from Jain and Buddhist movements. Samprati, the grandson of Ashoka also embraced Jainism. Samrat Samprati was influenced by the teachings of Jain monk Arya Suhasti Suri and he is known to have built 125,000 Jain Temples across India. Some of them are still found in towns of Ahmedabad, Viramgam, Ujjain, and Palitana. It is also said that just like Ashoka, Samprati sent messengers & preachers to Greece, Persia & middle-east for the spread of Jainism. But to date, no research has been done in this area. Thus, Jainism became a vital force under the Mauryan Rule. Chandragupta& Samprati is credited for the spread of Jainism in Southern India. Lakhs of Jain Temples & Jain Stupas were erected during their reign. However, due to the lack of royal patronage and its strict principles, along with the rise of Shankaracharya and Ramanujacharya, Jainism, once the major religion of southern India, began to decline. Mauryan Architecture – Architectural remains of the Maurya period even if few were all exquisite. There have been remains of a hypostyle building which are around 80 columns with a height of about 10 meters have been found in Kumhrar, 5 km from Patna Railway station, and is one of the very few sites that have been connected to the rule of the Mauryas. The style is rather reminiscent of Persian Achaemenid architecture. 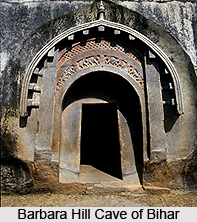 The grottoes of Barabar Caves are another example of Mauryan architecture, especially the decorated front of the Lomas Rishi grotto. These were offered by the Mauryas to the Buddhist sect of the Ajivikas. The most widespread example of Maurya architecture was the Pillars of Ashoka, often exquisitely decorated, with more than 40 spread throughout the sub-continent. Natural History – The protection of animals in India became serious business by the time of the Maurya dynasty; being the first empire to provide a unified political entity in India, the attitude of the Mauryas towards forests, its denizens, and fauna, in general, is of interest. The Mauryas firstly looked at forests as a resource. For them, the most important forest product was the elephant. Military might in those times depended not only upon horses and men but also battle-elephants; these played a role in the defeat of Seleucus, Alexander’s governor of Punjab. The Mauryas sought to preserve supplies of elephants since it was cheaper and took less time to catch, tame and train wild elephants than to raise them. Kautilya’s Arthashastra contains not only maxims on ancient statecraft but also unambiguously specifies the responsibilities of officials such as the Protector of the Elephant Forests. 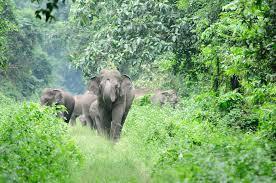 The Mauryas also designated separate forests to protect supplies of timber, as well as lions and tigers, for skins. Elsewhere the Protector of Animal’s also worked to eliminate thieves, tigers, and other predators to render the woods safe for grazing cattle. The Mauryas valued certain forest tracts in strategic or economic terms and instituted curbs and control measures over them. They regarded all forest tribes with distrust and controlled them with bribery and political subjugation. They employed some of them, the food-gatherers or Aranya to guard borders and trap animals. The sometimes tense and conflict-ridden relationship nevertheless enabled the Mauryas to guard their vast empire. When Ashoka embraced Buddhism in the latter part of his reign, he brought about significant changes in his style of governance, which included providing protection to fauna, and even relinquished the royal hunt. He was the first ruler in history to advocate conservation measures for wildlife and even had rules inscribed in stone edicts. The edicts proclaim that many followed the king’s example in giving up the slaughter of animals.